Our range of nose studs are avilable in a range of materials including 316L Surgical Steel, Titanium, Bioplast and BioFlex. Many of the ranges of nose piercing jewellery are available with straight and bent shafts. JoBananas sell a huge range of steel nose studs that are available with a curved or straight shaft. Which one is the right one for you is down to personal choice with both being sold in the same numbers. Gauges of these nose studs is either 0.8mm (20 gauge) or 1mm (18 gauge) and the part that fits through the nose piercing is typically 6mm in length. Many different designs are available incuding plain balls, cones, discs, hearts or stars as well as flat and claw set jewels. Our range of Titanium nose studs are also avalable in 0.8mm (20g) and 1mm (18g) but have the added advantage that they can be used for the initial nose piercing. They can also be anodised (coloured) in our range of exciting colours such as Bronze, Two Tone, Green and Rainbow as well as the traditional Highly Polished (Silver) finish. Just like the steel range anything from a plain small ball to a jewelled setting is also available. 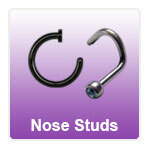 Many people favour The Bioflex nose studs due to its greater healing properties when used in a fresh piercing. Curved and straight Bioflex nose studs are sold in either 0.8mm or 1mm gauges set with Swarovski tiny crystals that really catch the light but are not too large in size. We also have a range of Coloured Bioflex nose rings in Silver, Black, Clear, Red and Glow in the Dark. Our Bioplast nose jewellery is made from from clear flexible Bioplast with curved or straight options in 18 and 20 gauge. Bioplast is also available with Titanium set jewels so can be anodised (coloured) giving it a more unique look. Bioplast like Bioflex can also be Autoclaved making it a great choice for an initial piercing. Another popular choice for nose piercing jewellery is the nose ring. Often referred to as an open nose ring these are inserted into the piercing and look like you are wearing a complete ring. A small flat section of the cut away ring holds the jewellery in place. Open nose rings are available in a range of gauges and diameters including 7, 8 and 9mm as well as a range of materials including Bioflex, Titanium (plain and anodised), Steel and PVD coatings. Open nose rings have proved to be a popular choice on our website for people after a different or alternative look. Open nose rings are also available in a 1.2mm (16 gauge). Also for people who wish to hide their nose piercings we stock a range of hider piercing retainers. These are ideal to retain your piercing but hide the hole at work, college or school. Our nose piercing hider studs are available in both clear and flesh tone offerings giving you the greatest chance of hiding your nose piercing.